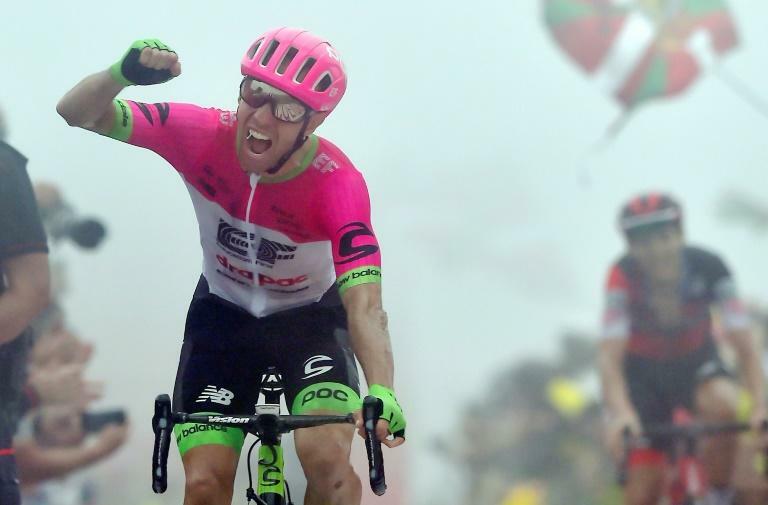 Britain's Simon Yates held on to his overall lead in the Tour of Spain on Wednesday as Canada's Michael Woods won the 17th stage on a foggy Basque Country summit packed all the way up with rowdy fans. On the cloud-shrouded final slopes, Yates lost eight seconds to his nearest rival, Spanish veteran Alejandro Valverde, whose Movistar teammate Nairo Quintana was dropped on the final climbs, virtually ending his hopes of eventual victory. Yates' red jersey was protected all the way up the final climb by his brother Adam and two other Mitchelton-Scott teammates. "I'm happy with what I did today. Adam was there with me for the entire climb, he did a really good job," Simon Yates said after surviving this major challenge. "Today was the day I was most worried about, so I'm happy to have it over with," he admitted. The 31-year-old Woods only began cycling seriously in his mid-20s and came seventh at la Vuelta last year before a second place finish in the Liege-Bastogne-Liege this season. Overcome with emotion, Woods cried as he dedicated the win to his recently stillborn son. "There were so many people on the roadside egging me on and my team manager was encouraging me to do it for my family," a weeping Woods said. "My wife and I lost our son recently, his name was Hunter and this is for him." "The whole time I was going up the climb I was thinking of him I wanted to win so bad for him and I did." Woods was involved in an early escape group and edged out Dylan Teuns of BMC on the ultra-steep final section while Sky's David de la Cruz came third. The day's biggest loser was Quintana, who now sits 2min 11sec down on Yates. The closest challenger is the 38-year-old Valverde who is 25 seconds back. Another Spaniard Enric Mas, of Quick Step, climbed to third 1min 22sec behind the red jersey. Yates dismissed suggestions that this was now a two-man race. Two further days of climbing remain on Saturday and Sunday, where the winner of this year's Vuelta will certainly be decided.